I have just got on the Gangnam Style bandwagon after watching him on Ellen the other week. I wish I could remember the exact conversation I had with dd about it. It went on for another couple of minutes before I actually got it, then I was saying GANG- NAM too slowly. Poor dd I think she is finally realizing her mother is getting old and senile!!!! It's been years since I have heard that expression "cack handed." It means she was all thumbs, or very un-coordinated. Money well spent in my humble opinion!!! 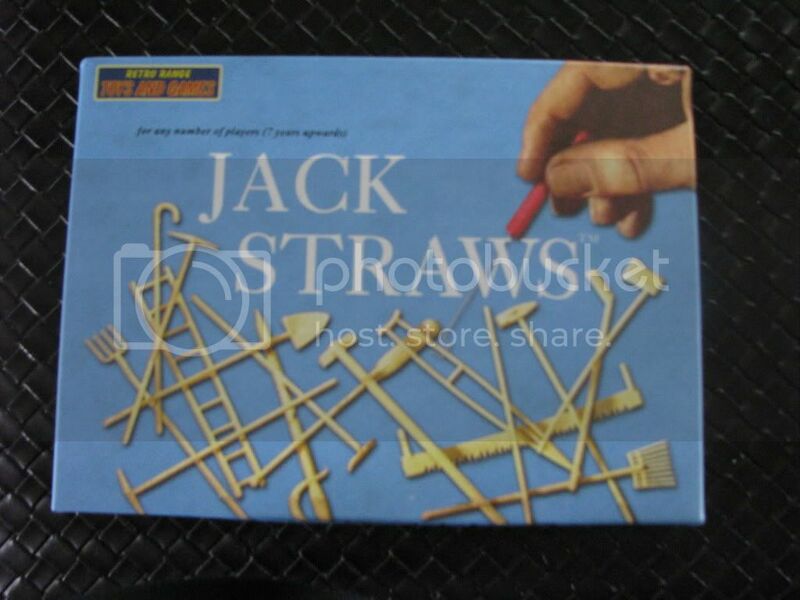 Do you remember this game from your childhood? I ordered a few things from Lakeland Plastics and the game was one of those things. The only problem with Lakeland Plastics is their delivery charge for non EU countries. So I spent 30 pounds so I didn't have to pay shipping and get the order shipped to my mam and she ships it on for me. Now the funny thing about my parcel, I ordered some candy, Licorice Alsorts amongst everything else. So when my mam went to mail the parcel it was going to cost just over 30 pounds. So the lady at the post office suggested she split the parcel up so it would be cheaper as it was over a certain weight. Well it was decided that my mam and step-father would eat the candy and it ended up costing just over thirteen pounds. So the cheap candy which cost two pounds would have cost me nineteen plus pounds. Then she mails it ground which can take anywhere between six weeks to three months to get here. It came in 8 days? Go figure....... My mam is going to Lakeland Plastics this next week, and the Lakeland Christmas catalog came on Friday, so need to study it to see if there is anything I need!!! The trees are starting to change and the weather has been glorious these past few days. Did put the flannel sheets on the bed as dh is cold, but still don't have the fire or heating on. 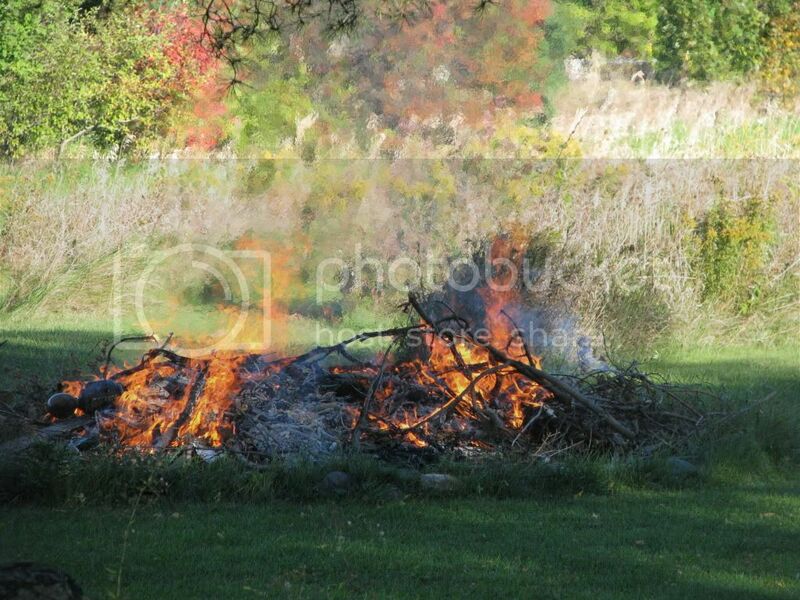 I was able to have a fire in the fire pit on Thursday as it was finally a calm day. Look at all the weeds in my raspberry bushes, anyone fancy helping me weed them? Well this week's "Home of the Week," is a doozy, I honestly don't know where to start. Suffice to say even if I did have $5.3 million I wouldn't be spending it on that! How on earth does anyone relax in a place like that. I'd be terrified of using anything in case I made a mess. Also see if you can notice a comfy chair anywhere? Look at the bed in the spare bedroom, it looks like a mattress on the floor; I'd do myself an injury getting myself in it on a night, and I'd need a lift to get me out of it in a morning!! Just to sit round the pool I would need to lose 150 pounds have a total makeover so I looked like a Hollywood star. Also make sure you look at the fifth photo, as I need to know what that blue pillow/tube thing is for? If I sat down on that I'd fall flat on my back, which makes for a delightful image of me flat on my back with my legs up in the air showing my bloomers off to the world through all those bloody glass windows. I'd have to employ a full time window cleaner to keep those windows clean. The "Cottage of the Week's" location is gorgeous, but the renovation they did just does not work in my opinion. So for that reason, I will pass on this one, mind you I couldn't afford the $975,000 price tag either. Well $1 million for "The Condo of the Week," I think I'll pass. However it's mainly because it 40 floors up, makes my stomach churn just thinking about it. 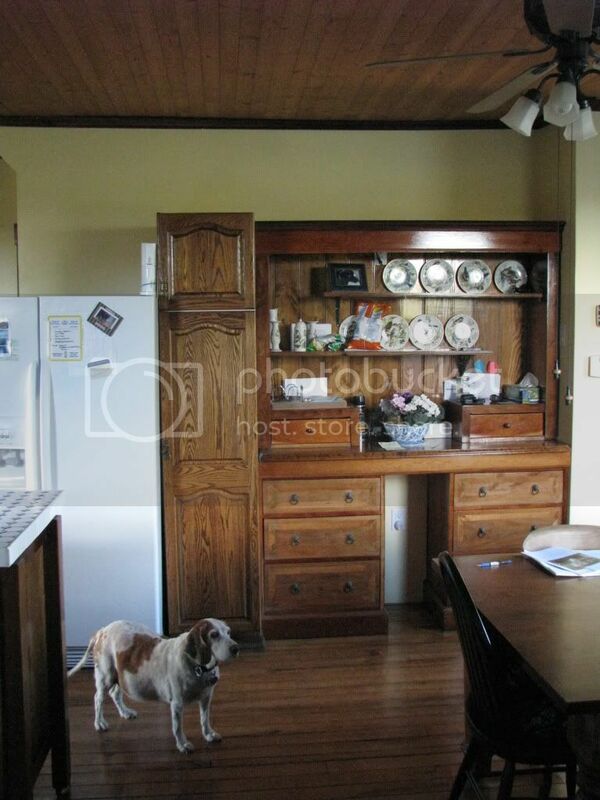 Also I do not like that kitchen at all. Will say you do get some stunning views from all those windows, but my stomach is churning again just thinking how high up you are. 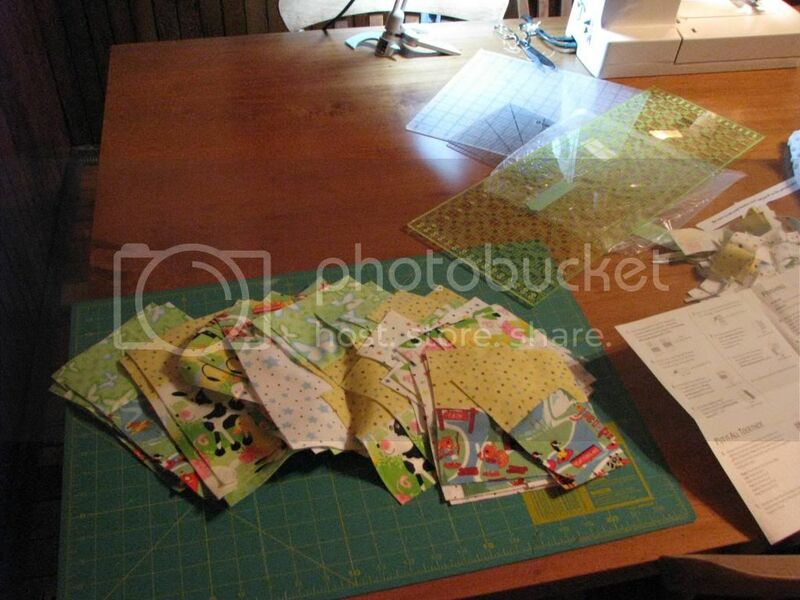 Which will only interest you if you are a quilter!! 1. I haven't sewn in probably a year. 2. I have never sewn this pattern before. 3. I did read the instructions, honestly, but obviously not well enough!! 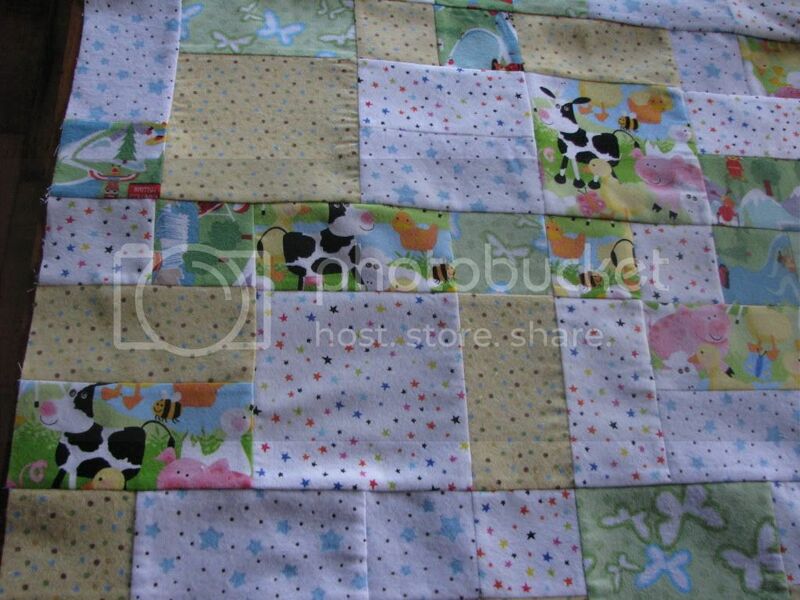 So I did post a couple of photos of the baby quilt pieces I cut out on yesterday's post. It wasn't until I had sewn a lot together and cut them up more, that I discovered I had been too enthusiastic in my cutting and sewing. As I had bought this as a kit there wasn't any surplus material left over, so I had to improvise. 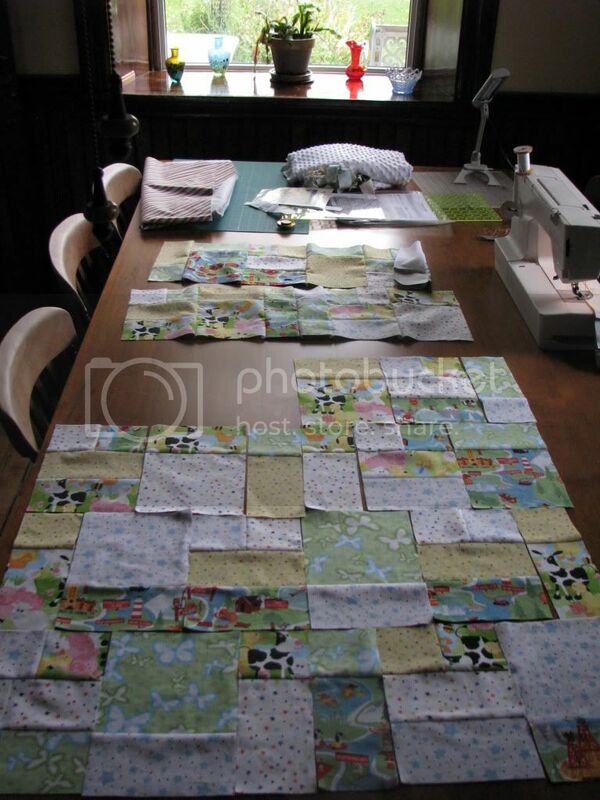 When I decided on what I liked best I sewed them all together to make the quilt top. This is a close up of part of it. So instead of it being called "The Yellow Brick Road," pattern, it's now called, "Gill's Surprise." Was watching Jamie Oliver the other day while having lunch, the show where he has Great Britain in the title? 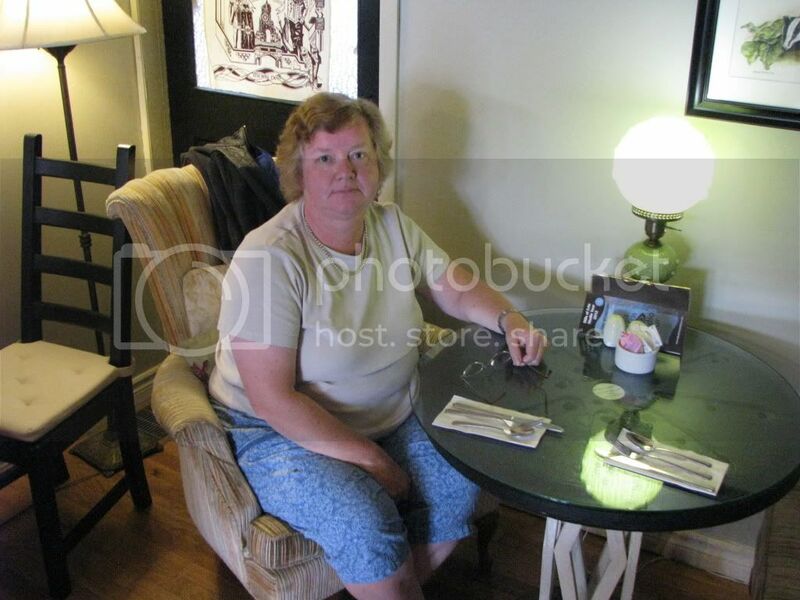 "Mind you don't get it stuck under your plate (false teeth)." Only in England.........by the way he wasn't making fun of her, he genuinely meant her to watch what it, as the roll was a crusty one. Now back to the title of the post. I went to the Post Office on Tuesday to mail Rose's blu-ray that she won. It came to $5.17, so far so good. So I said well how much is it going to cost, as normally they add taxes to the shipment. Discovered that they don't tax shipments to the States, but if I am mailing something within Canada they would have added 13% in taxes??? I am going to assume it's both the Federal and Provincial Governments fault for this stupid system, but it doesn't make flipping sense does it? Mind you the whole taxing thing in this country is strange to me and very confusing for tourists and visitors to the country. As just because it says $1 on the price tag, it hasn't added in the HST (taxes) like they do in Britain for example, so when you go to buy the $1 you discover it costs you $1.13. Even after 23 years of living here I still haven't got it all down pat!!! Now for the grocery question. If you said $14.87 you win!!! Kraft Canada had a deal where you paid $30 and you got a number of FPC (Free Product Coupons) for their items. 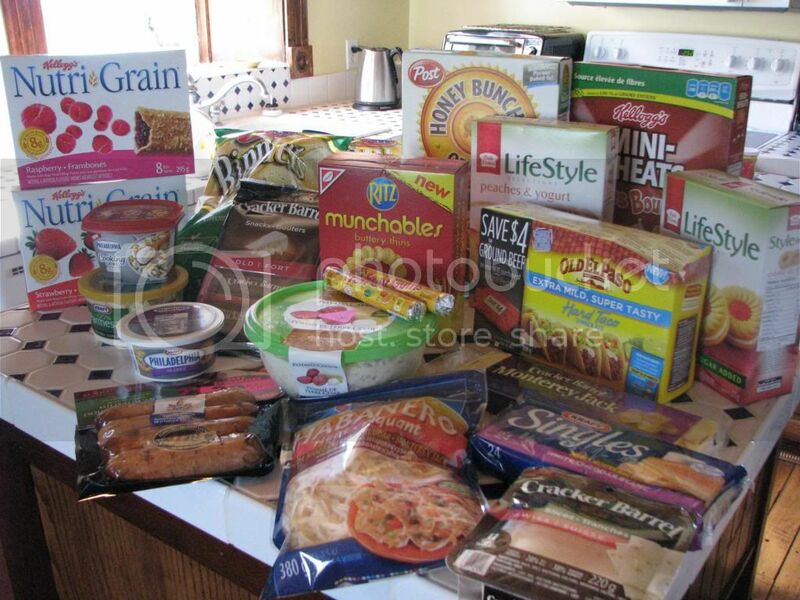 So all the Kraft products you see in the photo were "bought" with FPC. I had a FPC for the Old El Paso taco kit, a buy on get one free on the two boxes of cookies and the potato chips and two packages of Fruit Gums, were bought with a gift card I got given. I guess though I paid $44.87 if you factor in the $30 I paid, but the savings added up to $62.70, so I still came in ahead of the game and I still have a FPC for Amooza cheese snacks, that I have to pick up yet. Also, just to clarify, regarding the quilt club. The $10 is for the instructions on how to make each block, and the material for each block. 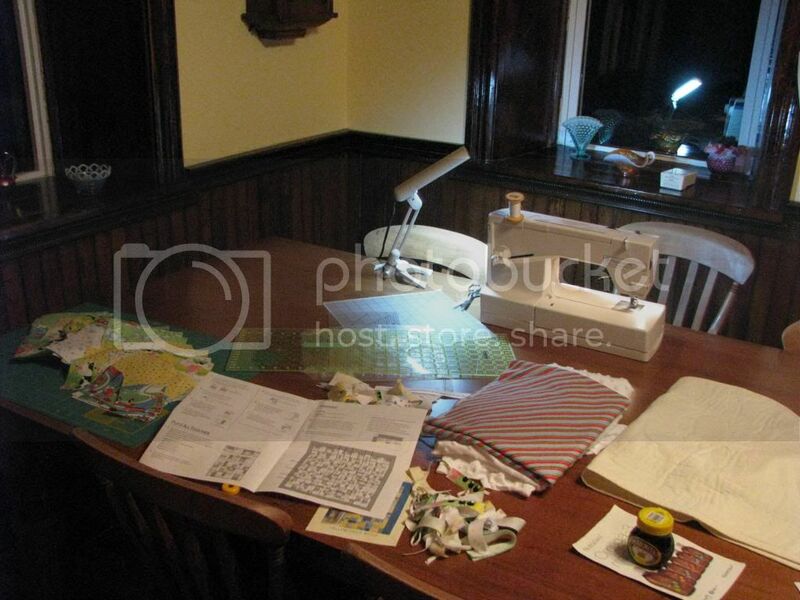 If you want to make a full sized quilt, you need the finishing kit, which costs around $170. I will not be purchasing the finishing kit as it's not in colours I like. I personally am not keen on the colourways of the finished quilt, there is a photo of the blue colourway on the bottom left of this webpage. 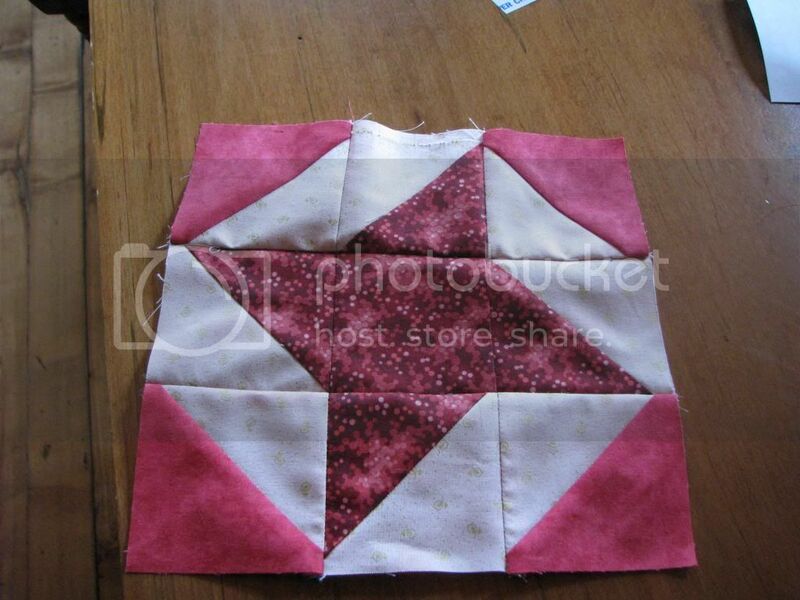 However if I wanted I could purchase the finishing kit, which I think is to finish the front of the quilt; then change the block colours to suit. The striped fabric is the border and the back is white minky, which is a material I have never ever used. I think if I can do an hour or two per day, I should get it done before the 6th of October.............I hope!!! yesterday with identifying the William Adams & Son piece. 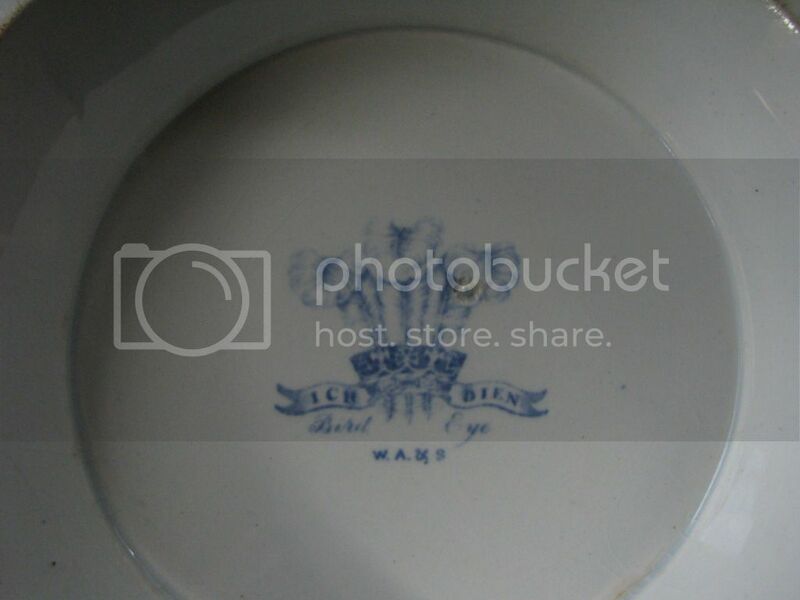 I sent an email to the Wedgwood Museum in England, as they bought out the William Adams factory in the 60's, to see if they could actually identify the exact age re; the backmark, as I still could not find the exact one. So fingers crossed they get back to me at some point. As you can see it's not perfect and that's because of the way I cut it out, not the way it was sewn. Though I felt like a brand new quilter when attempting this block as it's been over a year since I last did any quilting. Couldn't even remember how to use my 1/4 inch foot....... 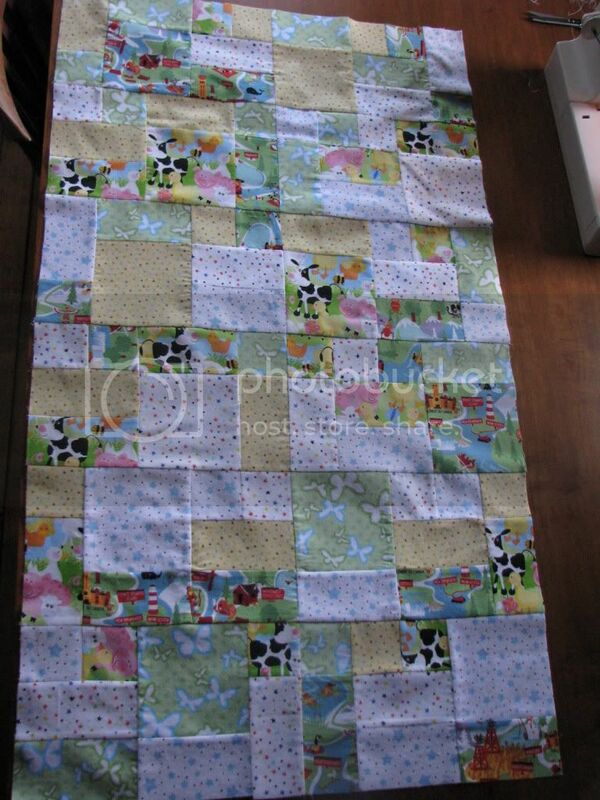 Mind you I had better remember it soon, as I have a baby quilt to make for Thanksgiving Weekend. I think I'll make a start on it today!!! However I am not 100% sure about the X, as it could be crossed swords? Also on the feather to the right it has an embossed flower on it. 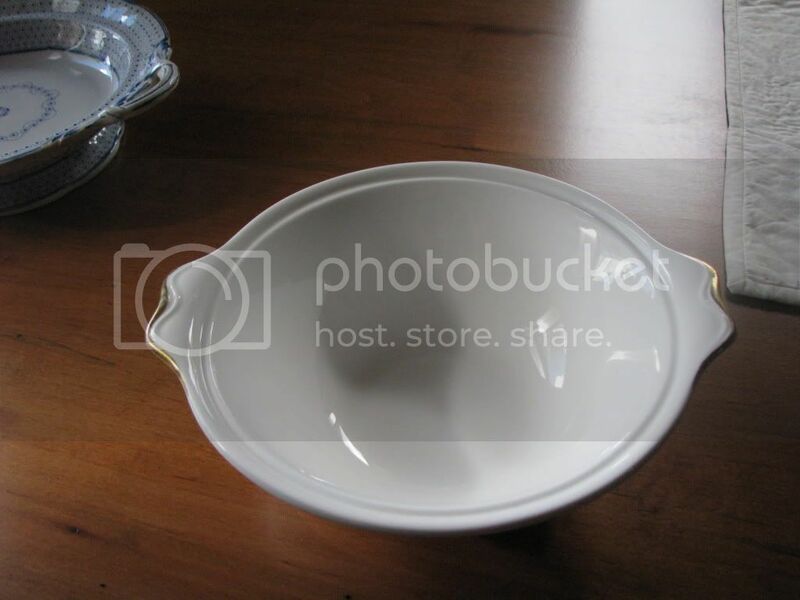 Here is another look at the footed bowl/dish. As you can see it's quite old with a lot of wear. However it's really pretty. 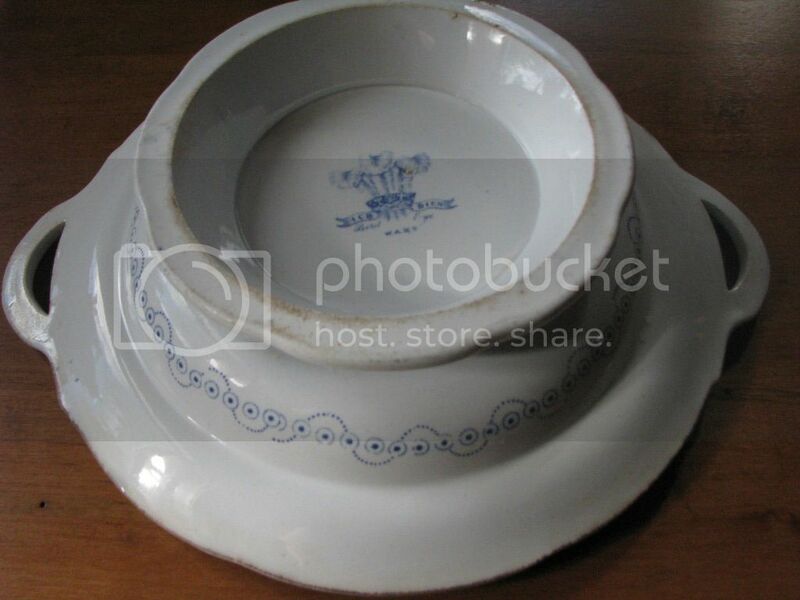 I would like to know the pattern and how old it is. 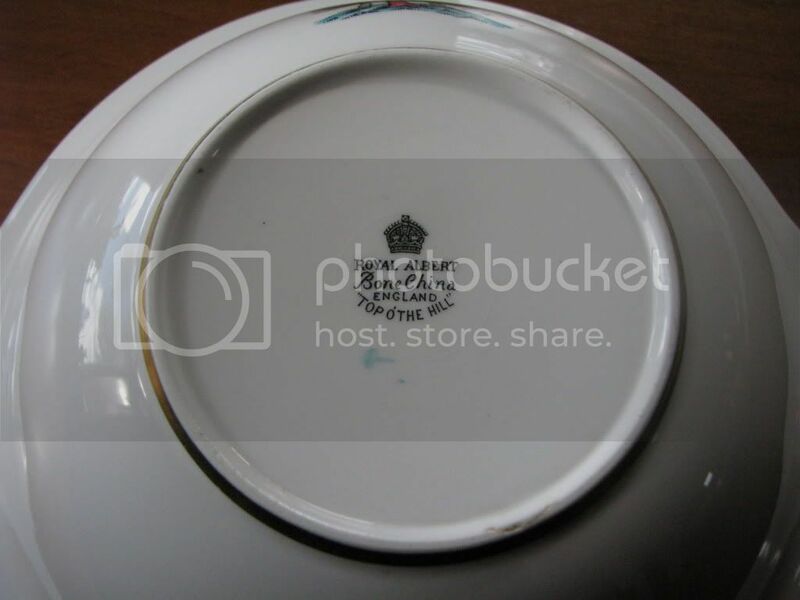 Now I know the maker of this piece, Royal Albert, "Top O' The Hill." Just want to know if it should have a lid with it. Again it's had a bit of use, and some of the gold finish has worn away. To my mind I would date this piece around the 60's, possibly into the 70's? Any thoughts? At a local charity shop they have items in the two windows that go up for auction. You write your bid in the book and one week it's one window; the next the other window. 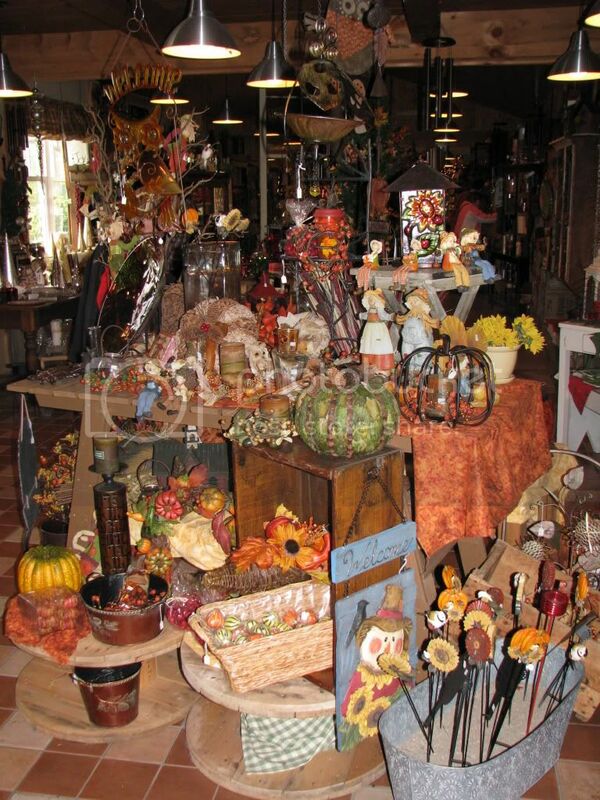 The store finds it can make more money on it's better items that way. I put a bid in for $20 for these two items and mine was the winning bid. Next week's window had nothing in that I liked, but they were setting up the other window when I picked up these items so didn't see everything they had in it, but there were a couple pieces of furniture I think we may bid for. I published another book review yesterday if you want to check it out here. As many of you know I was asked to review the movie "The Best Exotic Marigold Hotel." I decided to watch it on Saturday afternoon. I was supposed to watch it with a group of people but no one was around. Also I can concentrate more by myself. Anyhow, despite the fact it was a little slow to get going, it was an okay movie, and one where the longer you watch it, the more you get involved with the characters. However more importantly in my opinion, it made you think about it even after you had watched it. As it made me go over what the characters had said and done. My favourite character/actor was Muriel, played by Maggie Smith. She had a dislike for Asians,but due to various circumstances she ends up in India, which of course is populated by Asians. What she says and does is quite amusing. Although this movie isn't going to make you have a life changing experience, it will make you think afterwards about your own life. It also tells you that regardless of age, you can make changes to your normal life and you will adapt and survive if you have the right attitude. I think it's a movie aimed at people in the prime of their lives, more than the youngsters. Dd had seen it and said it was okay, but it was more for people "our age group," and I tend to agree with her. For those of you who have seen it but are not British, did you enjoy it, as with the main characters being British based I wasn't sure if you would "get" all the little British jokes and comments? I will watch it again and I would like to read the book the movie was based on, "These Foolish Things," by Deborah Moggach. As mentioned I am giving away the Blu-ray disc and the winner is.................Rose from Pics and Piecing...........well done Rose. Thanks to all that entered. why, just looking at dh annoyed the crap out of me, and truth be told it did the same to him when he looked at me. So that made for a pleasant day all around!!! We go to Mark's Work Wearhouse to buy dh new work pants and of course they only had the one pair. They do have a good system where you can order them from another location and ship them to your nearest store free of charge. However just one year it would be nice to actually go into the store and have them in stock. I had a headache all day which never let up. I cut grass on Friday so my allergies were horrible. Discovered cutting the grass drives my nose crazy which in turn makes me miserable. I am on Reactine at the moment giving that a try, doesn't seem to work any better than any other of the pills do. I watched the movie I'm giving away later today, and didn't fall in love with it like I thought I would. Will review it tomorrow with my giveaway. So all in all felt like a miserable day, especially when it rained and was very windy. Fingers crossed Sunday is a better day!! On Thursday it was dh's birthday, so we went to St. Jacobs and Elmira for part of the day. 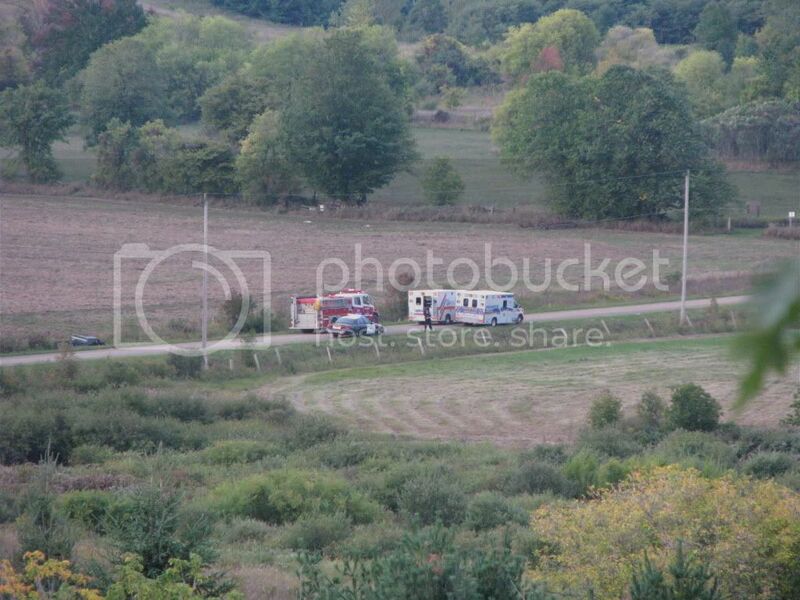 See the car in the field, it had flipped over by going too fast along the newly graveled road. Will have to say Thursday wasn't the best of days and just after we got to St. Jacobs it started to rain, so we got what we wanted and then headed to the restaurant in Elmira. Dessert was mainly hot made pies and they were perfect, along with a fruit crisp and baked apples. I had half a slice of Mississippi Mud Pie, which is something I have never had before and it was something I would love to have again. I also had a slice of custard pie, which was perfect. I forgot to take a photo of those. 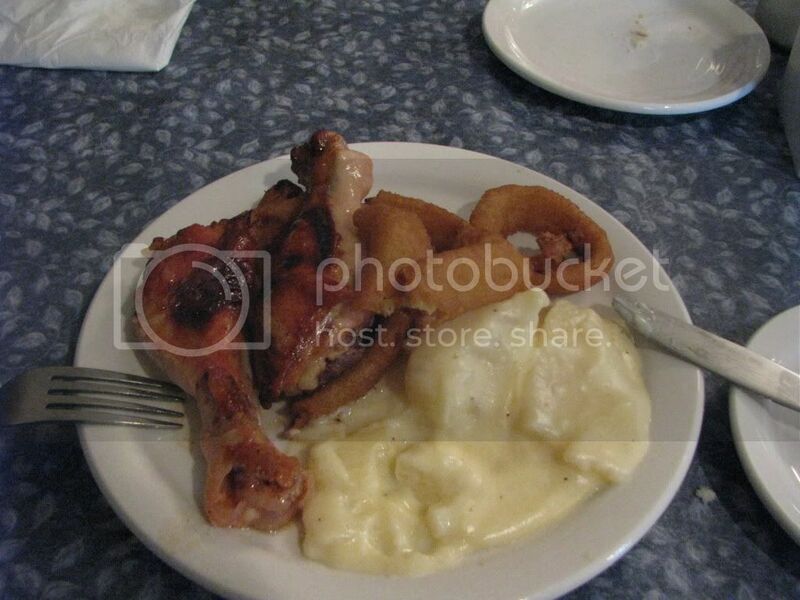 It was $12.99 for the lunch buffet, and as it was dh's birthday he got his meal for free. I personally found the food bland, which is a major surprise as I do not like spice at all in my food, so of course bland tasting food is the way to go for me!!! Also be warned on "market days" the place is busy. It was "market day," on Thursday and there were two bus loads of people in there so it was busy, along with regular people like ourselves. I will say I was one of the younger people there, other than the restaurant employees. 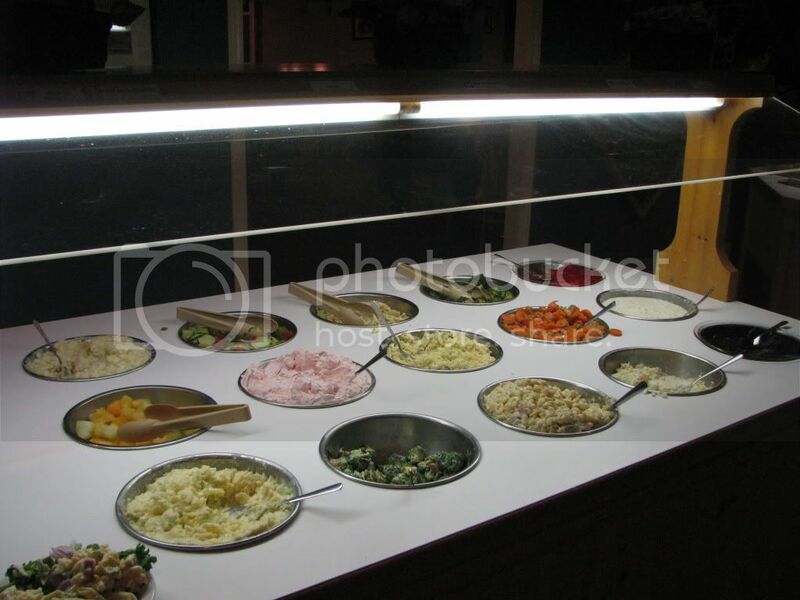 Will we go again, yes as the salad bar and the dessert bar was perfect. The hot foods needed work, and due to the two bus loads of people, the line up for the hot food was a little long. 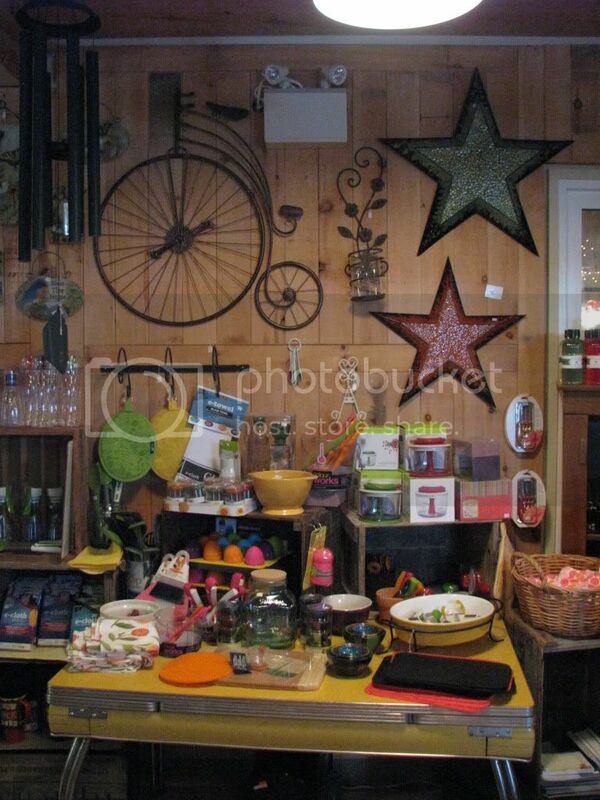 They also had a gift shop and a quilt shop attached to the restaurant. It was a feast for the eyes and to be honest it was very overwhelming. 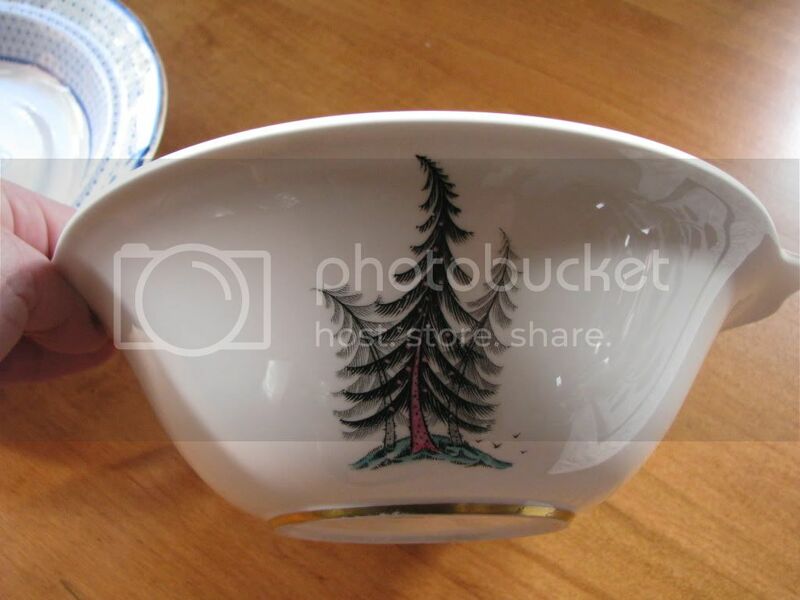 I loved this enamel ware. 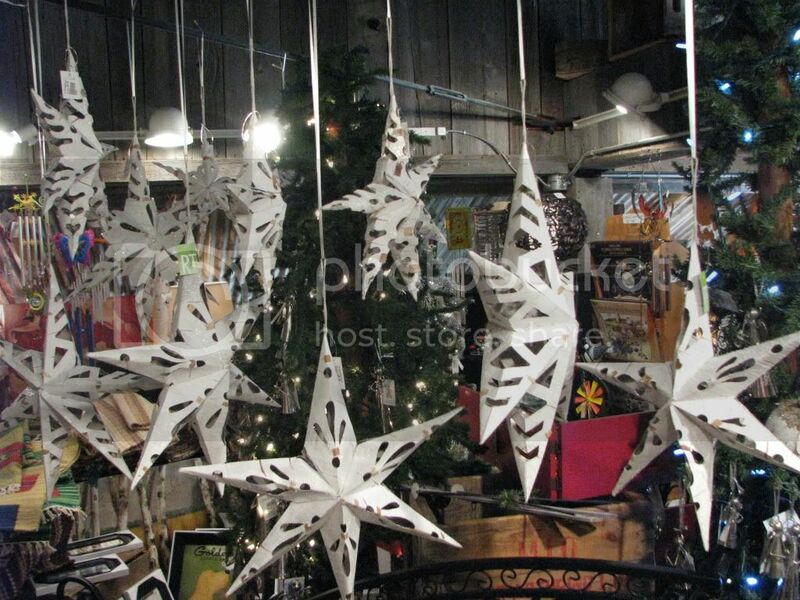 I loved the big stars on the wall. Of course there was lots of Christmas stuff out. I forgot to take some photos of the quilt store; but it was gorgeous. All in all a good day out with dh. Just a reminder; if you haven't already remember to enter my giveaway, to be drawn on Sunday. I am confused by this weeks "Home of the Week." On one hand it's a lovely house, but what has happened to the soul of it? All painted white I'm guessing? I do love the wallpaper on the stairs though and think that's a great idea; half wood and half wall paper. Flipping expensive though? I wish I had the $2.7 million to pay for this week's "Cottage of the Week." Granted it's a bit big, well a lot big, but it would be a fun place to have the kids and grand kids over. The one thing I would do though is get rid of the carpets in the kitchen, not a fan of those. However do love those huge wide floor boards throughout the property. Even the pirate ship is neat. Well once again another property, this time a condo, where the owner is allergic to colour!! At $950,000 this is one pricey "Condo of the Week." Will say that is a nice terrace and great views. Otherwise, I will pass!! I am dying to buy some of this shortbread. 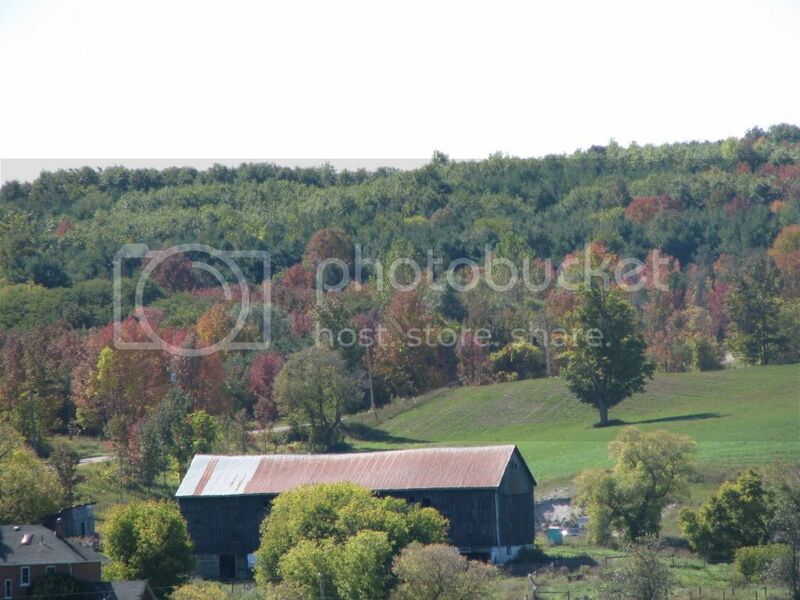 We had a trip to Erin, Ontario on Wednesday as it wasn't raining and it had been years since I was there. 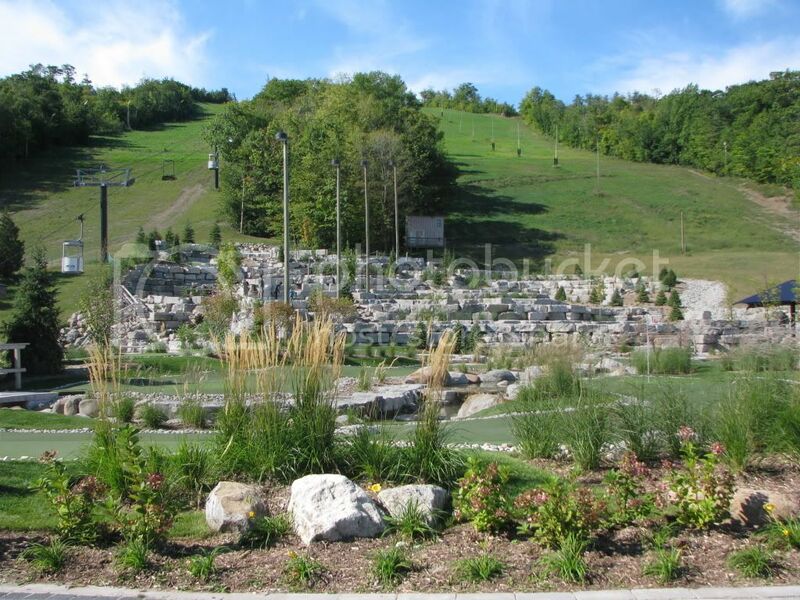 Now will say don't go by what your GPS says, as it took us to Hillsburgh, Ontario? Took us ages to flipping well find Erin, as there were a couple of closed roads. 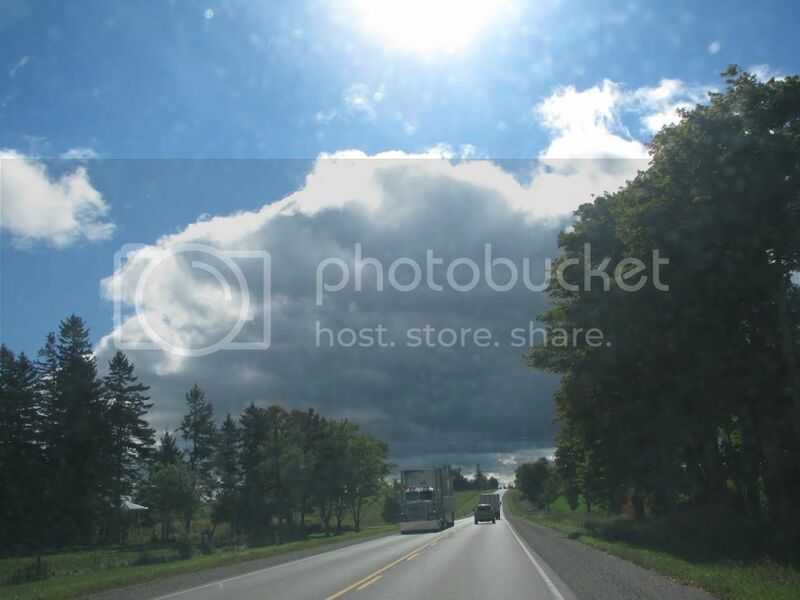 Plus we were driving towards that huge cloud. Looked a bit brighter to the west, but we weren't going in that direction!!! We finally found Erin, and this is a shot of the main street. 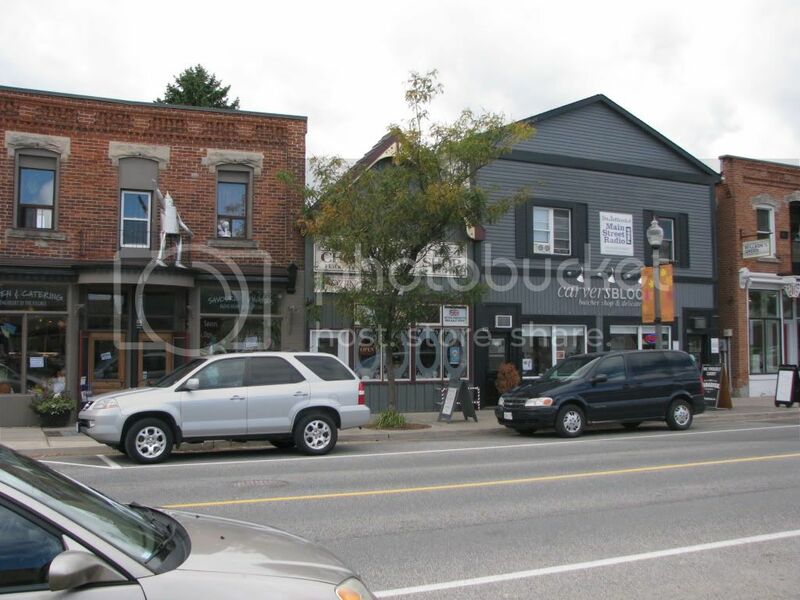 Typical small town Ontario, very pretty. 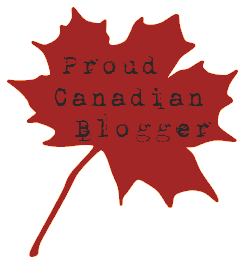 Anyway Elizabeth thank you for stopping me in the street and I encourage everyone to pop by her blog and say hello. We stopped for lunch in Tintagels Tea Room, which is a British style restaurant. Dh even took a photo of me waiting for our meal. 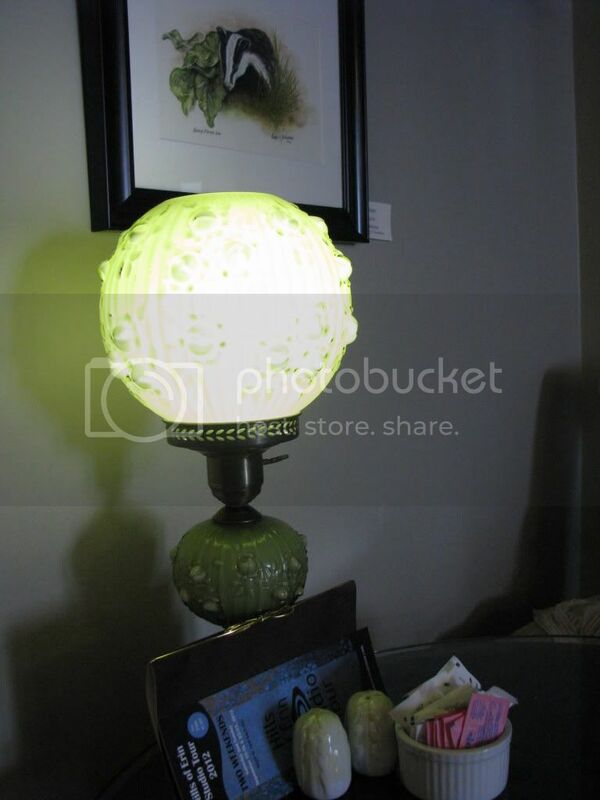 The green lamp on our table was a period piece and this photo does not do it justice, I loved it. We also liked the badger picture, but at $190 it was a bit pricey for us!! 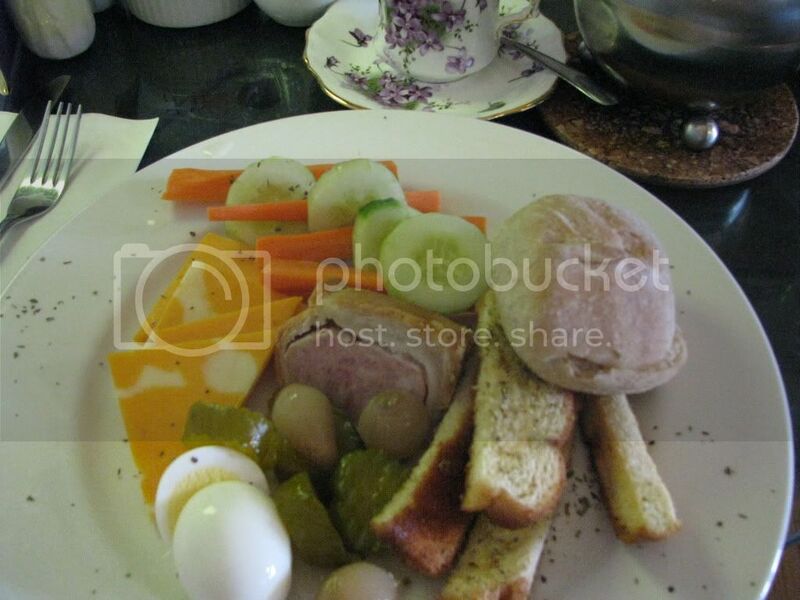 I ordered a Ploughman's Lunch, minus the Branston Pickle and the celery sticks, along with a pot of tea. Didn't eat the carrot sticks or the dill pickles either, and dh had the roll with two pieces of cheese as he was hungry. The egg was pickled, and it tasted horrible, which surprised me as I always loved picked eggs? 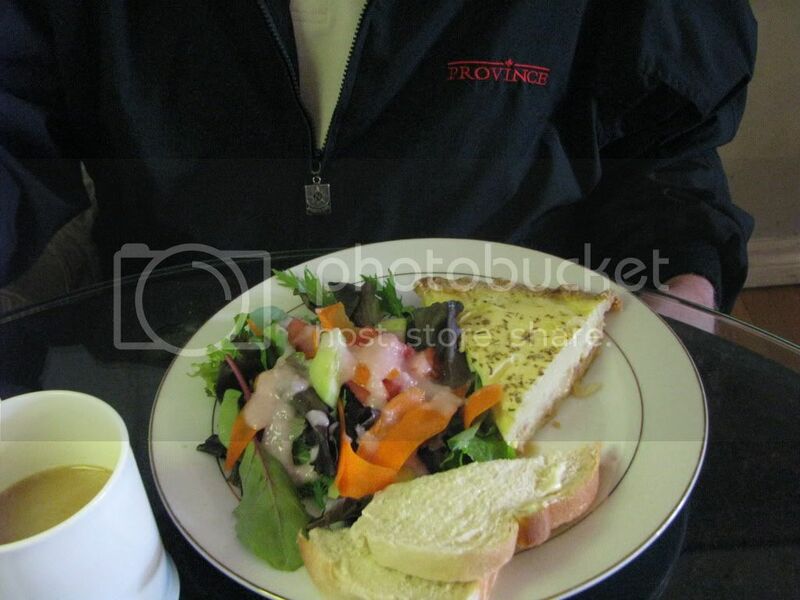 Dh had a ham and Swiss cheese quiche with a slice of bread, organic greens, with some weird looking dressing on the top of it, and a coffee. 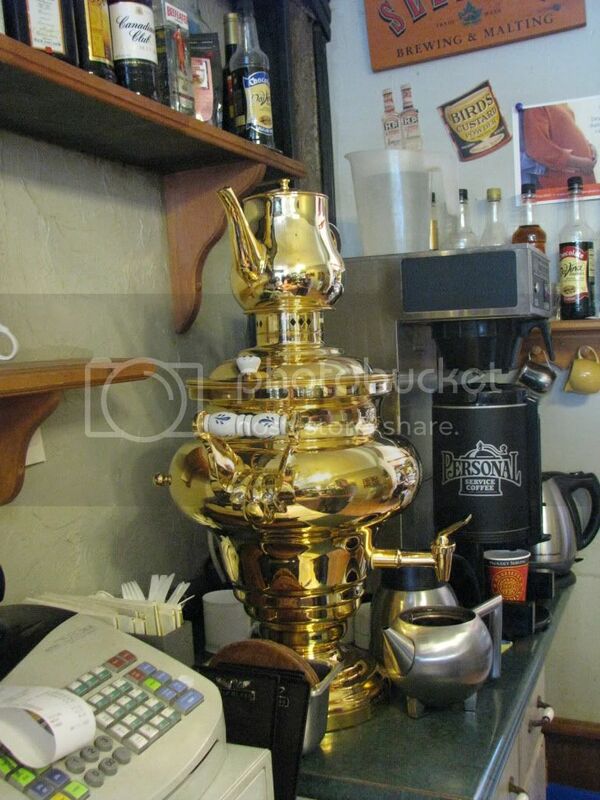 While I was paying the bill ($34) I noticed the really neat tea urn. I had never seen one like it before and the lady said they had only had it a couple of weeks. 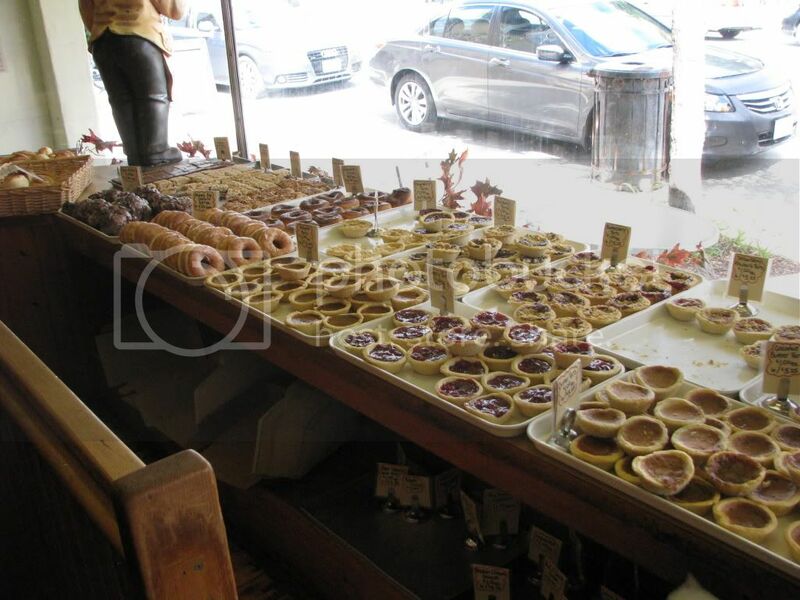 Further up the Main street is Holtom's Bakery. Honestly where do you start to make your choices? 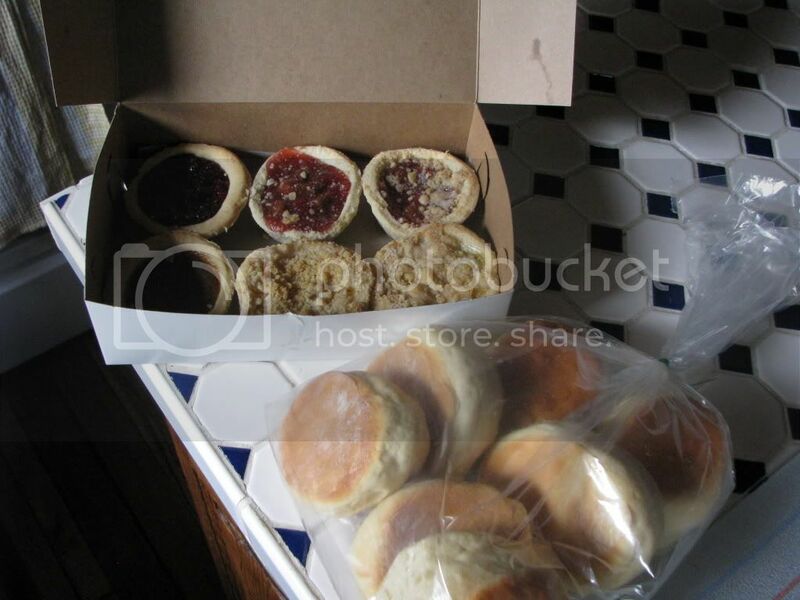 We purchased two strawberry and rhubarb tart, two peach tarts, a pumpkin tart, a raspberry tart and seven scones. Should have been six but she popped an extra one in for us. All in all well worth the $9.10 we paid for them. That's the best pastry I have eaten in an awful long time. 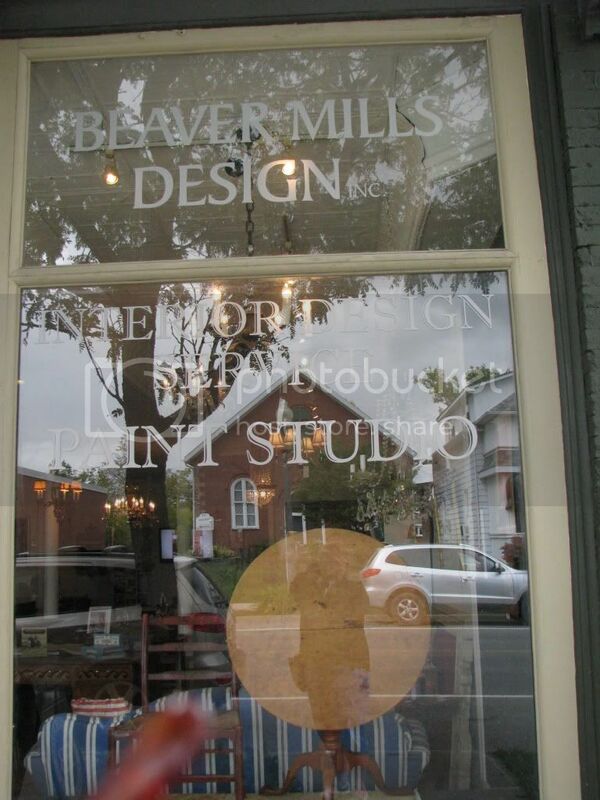 Further up the road is Beaver Mills Design. Now this is a rotten photo, but the table in the window was stunning. They are a design studio and antique dealer. 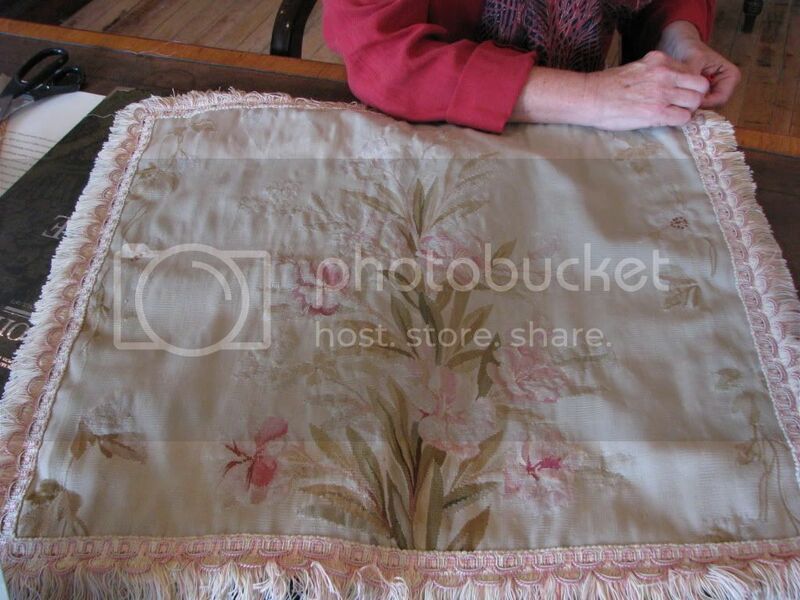 The lady was tidying up this tapestry cushion cover which was gorgeous, again my photo does not do it justice at all. Should say the edging on the cover was no where near as old as the centre panel. 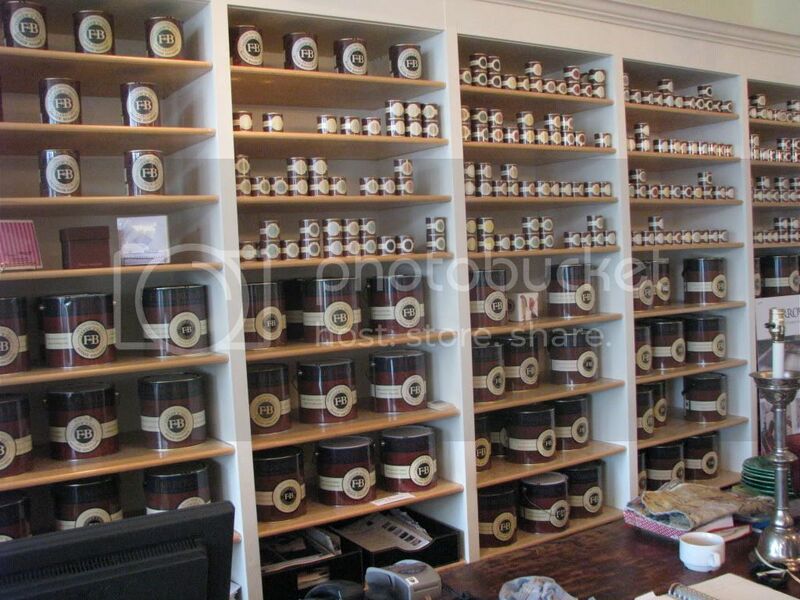 This is what caught my eye though a full wall of shelves full of Farrow and Ball paints. A paint lovers paradise. I thought I had died and gone to heaven!! I would added more links to the place but honestly I was surprised at how many companies don't have web sites. 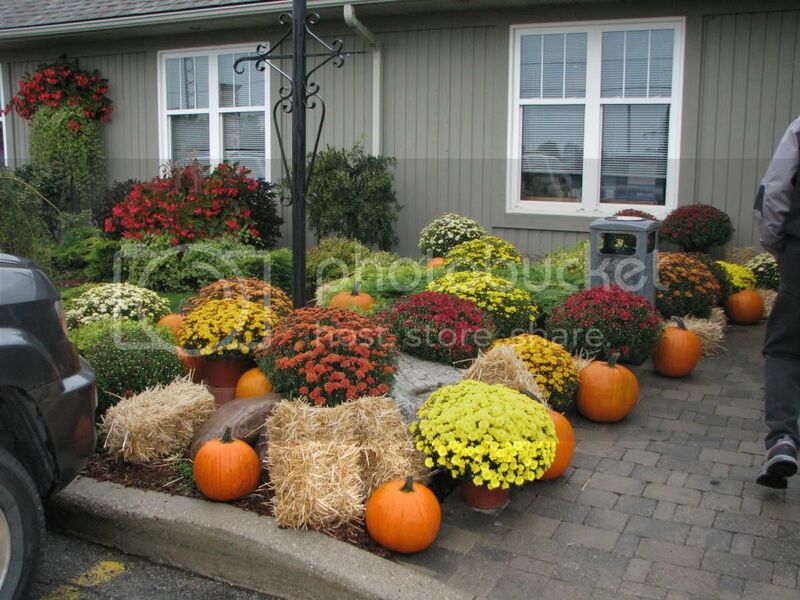 When we got home we did a couple more preparing for Winter chores done. Putting the tarps over the winter wood, so it'll be nice and dry when we put the fire on. 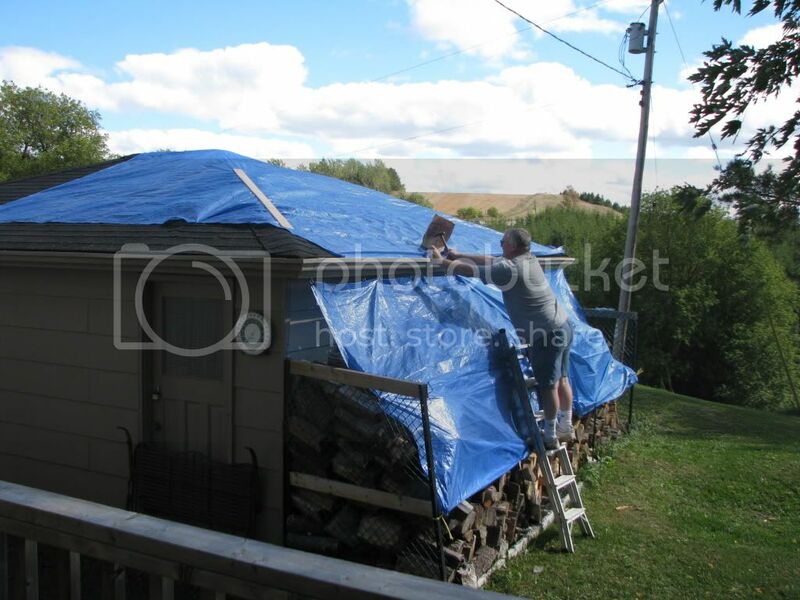 Also putting a tarp on the back of the garage roof, as it is raining in, and is a must do job for next Spring, when we have burned all the wood. Also as it's going to cost around $2,500 to do it, I need to save up the money first. Just a reminder if you haven't entered my giveaway, please do so here. I was taking photos of the kitchen (more about that later) and Molly wandered into the kitchen to see if I was cooking and I snapped her in one of the photos. 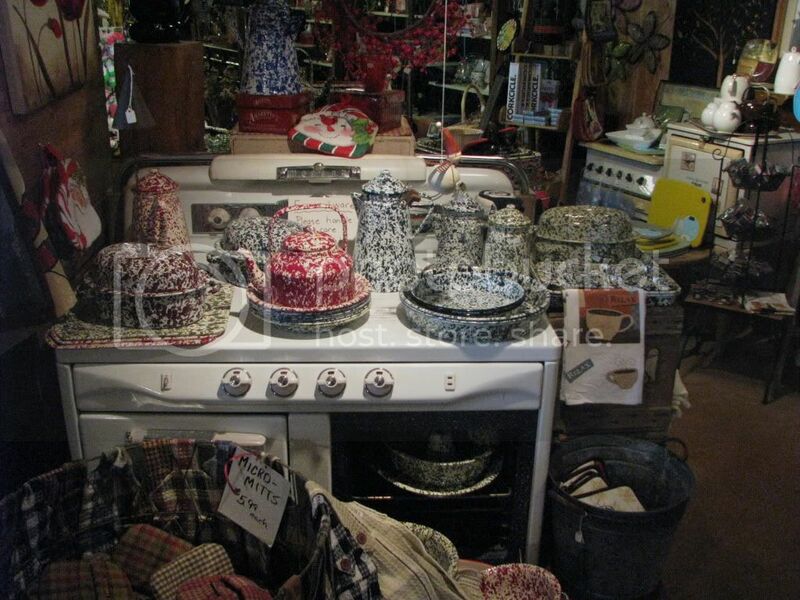 I would dearly love a new kitchen as ours has seen better days, but we just don't have the money to pull it all out and re-do it how I would really like, so we are planning on doing a "mini" renovation after we finish the basement. We are going to replace the sink, taps and counter tops and the hardware. Also fully replace the under sink cupboard and put the old doors back on. In the scheme of things not a big deal, but I do hope it freshens it up and makes it look a lot tidier. It poured down on Tuesday, so it was a good day to run some errands to get those silly jobs that have been wanting done for a long time done. We also headed to Cookstown Outlet Mall but once again didn't buy anything. 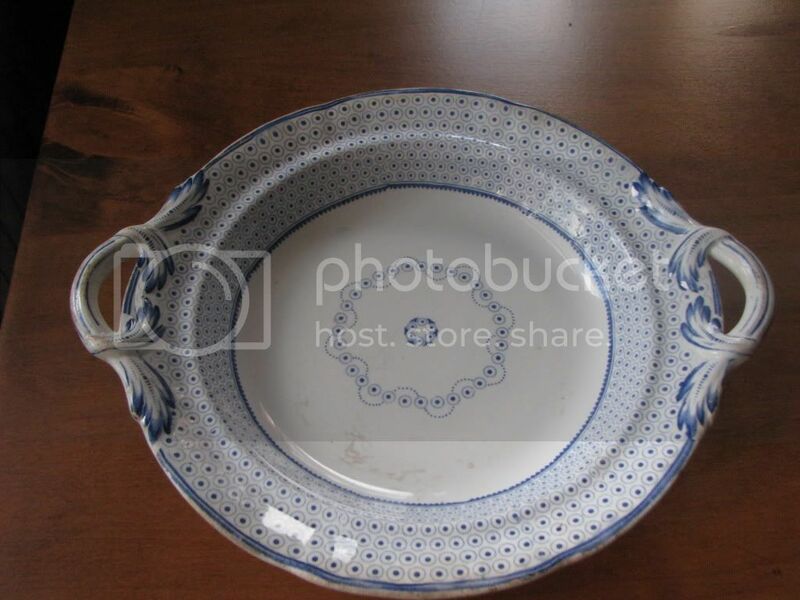 As outlet malls go, its not the greatest; although I could have spent a small fortune in the Villeroy and Boch store and would love to have this pattern for my dinnerware. 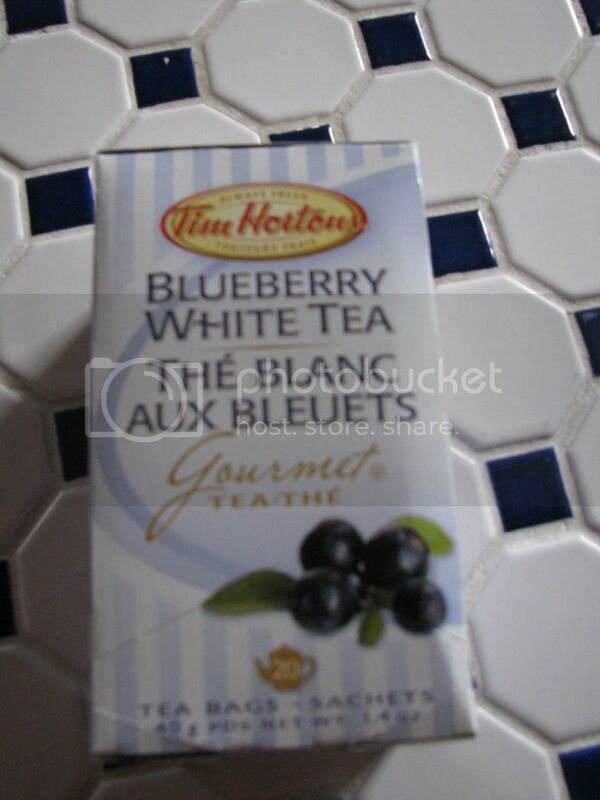 I have also discovered a new to me drink at Tim Hortons which I adore, Blueberry White Tea, which I have with two milks. It is like having a sweet treat without all the extra calories. Dh took a truck load of garbage to the dump, luckily it was light in weight so only cost $8.99 to dispose off. The blue tarps are to go on the log pile to keep it dry and a big one has to go on the garage roof, as we need a new roof, but it will have to wait for another year. It was too windy on Monday to go on the roof though. 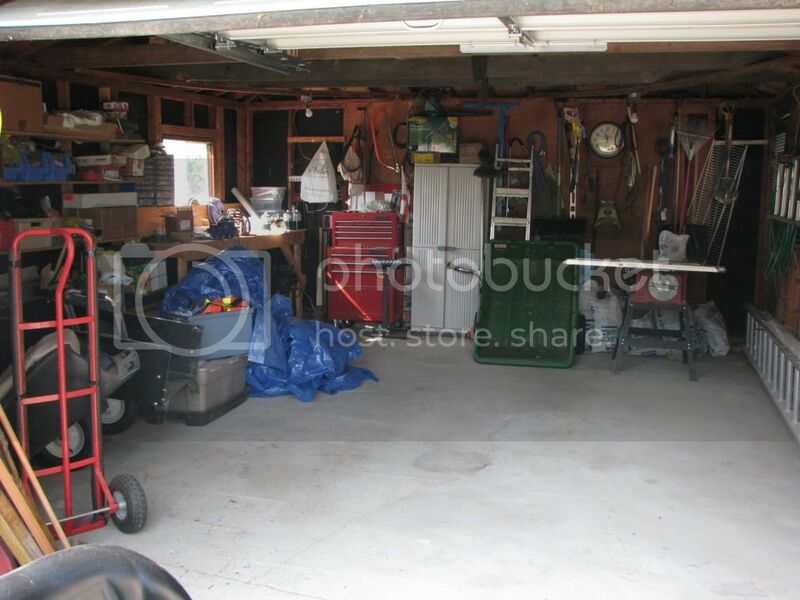 There is now plenty of room in the garage, even with the tractor to park my car inside. Mind you it helps that I only have half a car!!!! I am up to 5,750 kilometres on my mileage with my car. So I am averaging just over 1,000 kilometres a month; no idea where I go? Monday was a perfect drying day and I took advantage of it with a pile of laundry, which in turn makes plenty of ironing to do!! Then I started cutting the grass, which really needed cutting. Have you noticed how early it starts to get dark now? I see the leaves are starting to fall as well. I hope not to have the heating on for another month yet, but we'll see. Have you entered my giveaway yet? Click here to enter. I am all excited as I was contacted last week and asked if I would like to review "The Best Exotic Marigold Hotel," movie staring Judi Dench, Maggie Smith and Tom Wilkinson as well as many other actors. Then to add to all of that, I was sent a gift basket as a thank you. The gift basket has a package of Marigold seeds, which I'll plant next year. 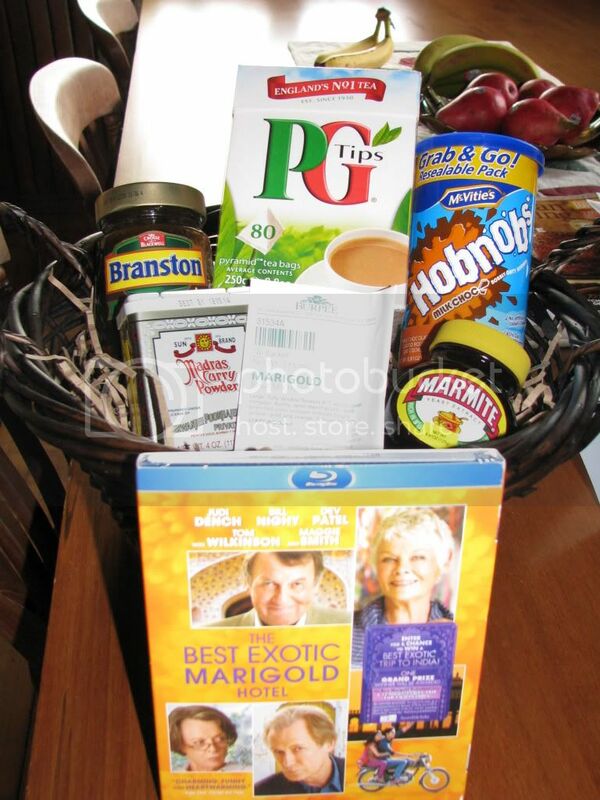 A box of PG Tips tea, a package of Hobnobs (I LOVE THESE), a jar of Marmite, a jar of Branston Pickle and a container of Curry Powder. They also sent me not only the DVD of the movie, but the Blu-ray disc. We do not have a Blu-ray player, so I was given permission to give the Blu-ray disc away. Now there is nothing exciting to do other than leave a comment saying you would like to win this. Of course you must have a Blu-ray player, as otherwise you can't watch it. Also does anyone know if you can play a Blu-ray disc anywhere in the world? If you can, then it's open to anyone in the world. If you can't well it's only open to folk who live in Canada or the US. I'll draw a name on Sunday 23rd of September. P.S. I haven't watched the movie yet, hoping to watch it later in the week, really looking forward to watching it. No idea what to post about? So I'll start writing and no doubt my fingers will type something? Picked up my sari on Saturday for the Indian baby shower, which should be happening over Thanksgiving weekend......though not confirmed. Will say it is very nice and luckily it was too long for me, so I have had to hitch it up, which hides more of my extra bits around my middle!!!! The child/idiot proof way of attaching Velcro and hooks, works a charm as I can sort of put it on without any help. Mind you I do have to wear my glasses, so I can see where the slots are to put the hooks. "R" was also very happy with the way Reeka made the tops, and "R" is pretty fussy. Poor "R" had some "bad" news at the doctors when they told her the baby is very small for the gestation period, and she will deliver a small baby, probably no more than six pounds, and she has to go see a dietitian. She is 22 weeks and has only put on 10 lbs, and is barely showing at all. Now as I pointed out, would you rather try and push out a 10 lb baby naturally or a 6 lb baby? Me personally a 6 pounder would suit me fine. Also the more weight you put on the more you have to try and get rid off after the baby is born. Here I am, dd is coming up 27 years of age and I'm still trying to lose the baby weight from when I had her!!!! Incidentally, ds was only 6lbs 10 oz and I was the size of a beached whale.........I must had been carrying a lot of water with him.......yep that's the reason. Dh is on vacation again this week, so today we are going to clean out the garage....something everyone should do when on vacation, right? 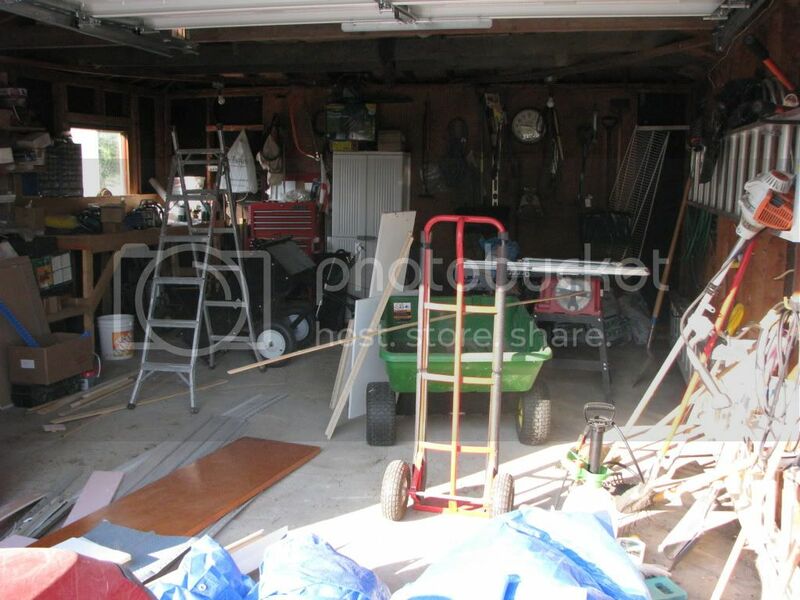 It's getting to the point that I should start parking my car in the garage, and at this moment, I'm having trouble getting my tractor in there for the mess. So I will try and remember to take before and after photos. Not sure what else we are going to do, as the weather is a bit iffy this week. Hope you all have a good week.........and is it just me, or do you think this month is flying by? in Collingwood where we visited last week. 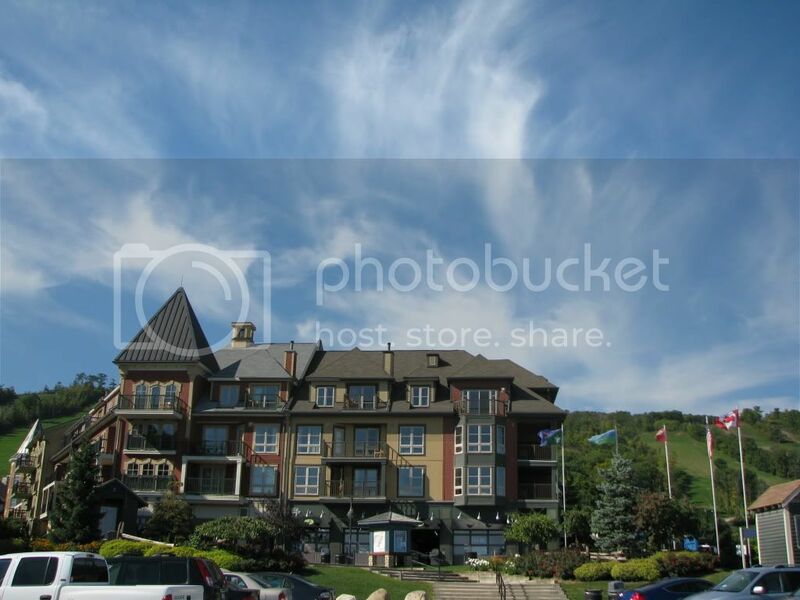 The Blue Mountain resort is a big ski resort, but there is lots to do all through the year there. The first photo shows part of the resort. You can stay in the condos and there is plenty of shopping and entertainment and of course sports. 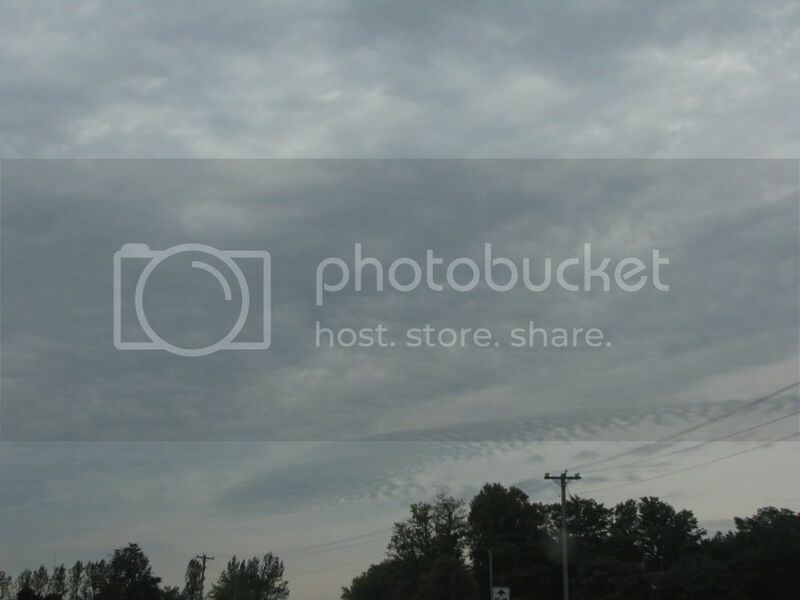 I was actually taking this photo for the sky. They put a new mini golf section a year or two ago and it is very pretty. 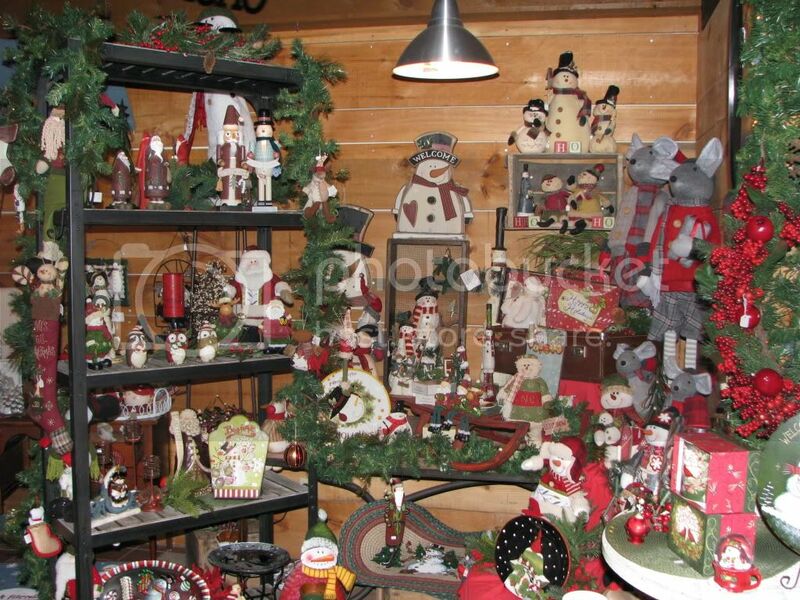 There was a number of Christmas decorations up in the stores, despite it being only September. 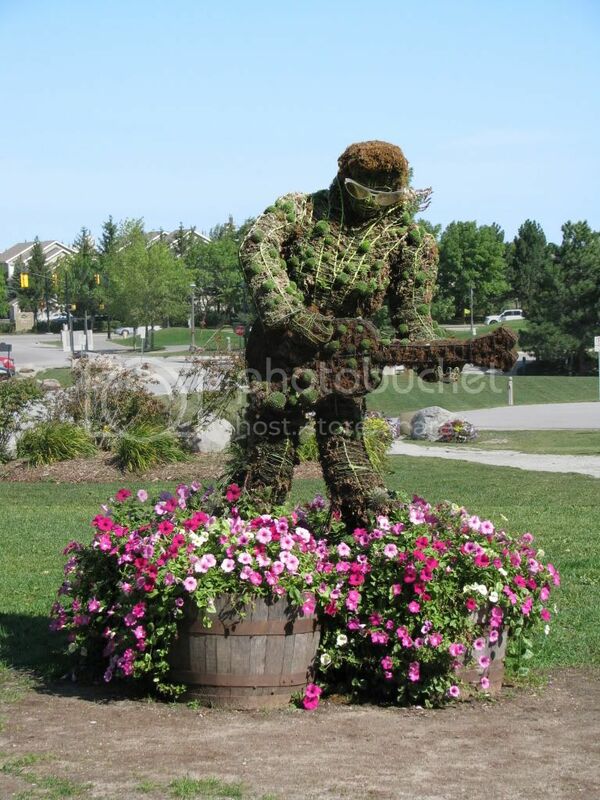 Collingwood has a big Elvis festival every year and this was a topiary of him in the resort. Update on baby shower progress..